› walls, glass, tiles etc. The Rapid Air technology enables even inexperienced applicators a bubble-free, easy and quick installation, especially of large format designs. In the Rapid Air technology a adhesive made of polyacrylate is used. Small microchannels in the adhesive make it possible to squeeze out air bubbles under the foil. The surface must be free of dirt, dust, silicone, dispersion and latex paint. 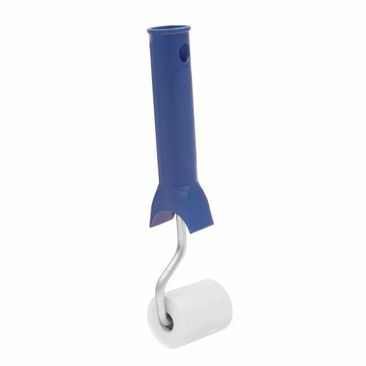 We strongly recommend to use a squeegee or a wallpaper roller. Have a look on our supplies. 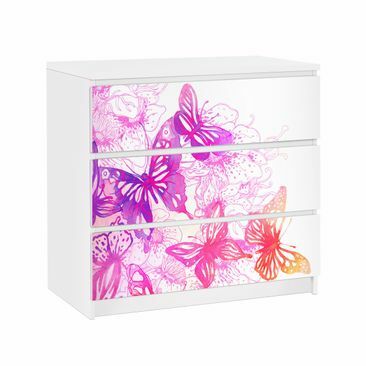 Your Furniture Sticker in three parts per 20cm x 80cm. 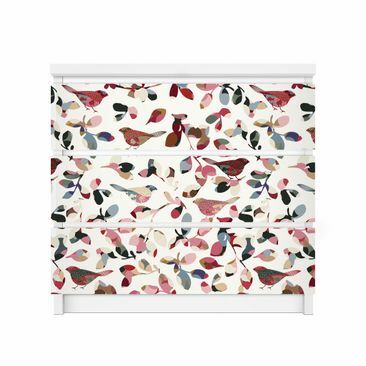 You should use a squeegee or a wallpaper roller! You'll need it to squeeze out air bubbles under the furniture foil. 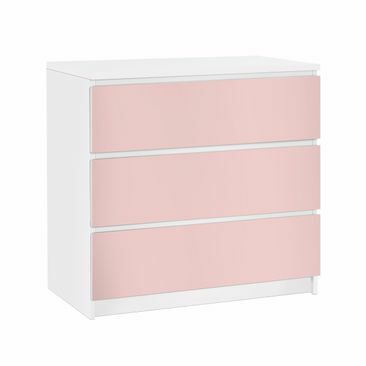 The Furniture Sticker fits exactly on the front of the three Malm drawers. You do not have to disassemble the dresser. Make sure your Malm is clean and free of dirt, dust, silicone, dispersion and latex paint. 1. Prepare the furniture. 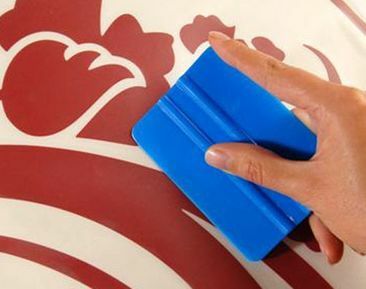 The surface should be clean, smooth and free of grease, oil paints or dirt. 2. Paste the three stickers one after another. 3. 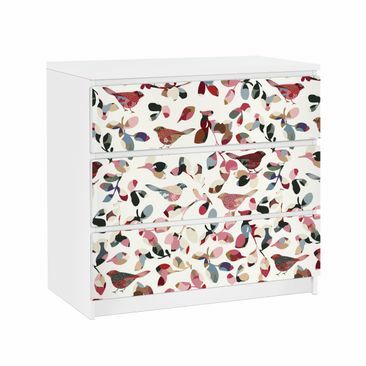 Remove only the upper part of the furniture sticker gently and fix this on the drawer. Then you pull the support paper bit by bit off. 4. A papering roll or a squeegee help you avoid air bubbles and voilà, done! 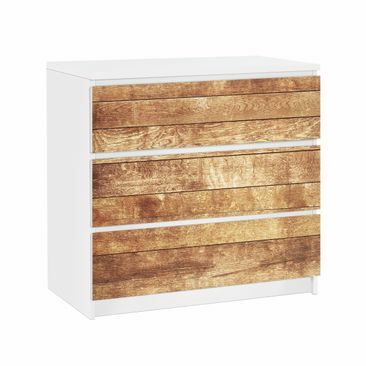 Give your old Malm dresser a new look. 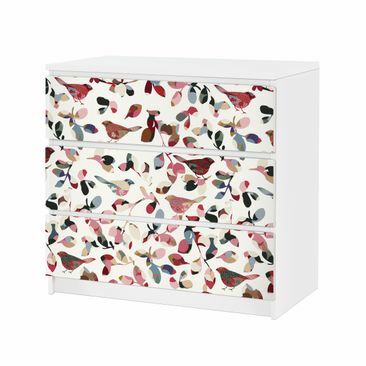 With our furniture decals you can easily beef up your beloved Malm dresser. 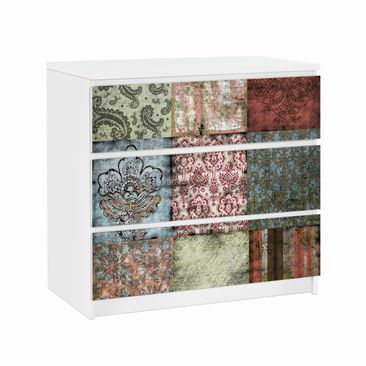 Just stick the decoration foil on the front of the drawers to create a completely new appearance. Choose your style from countless motives and patterns. From light and cosy pastel shades for a relaxed ambiance in your bedroom to bright eye catchers and hip artworks for kids and teen rooms - there is something for everyone! 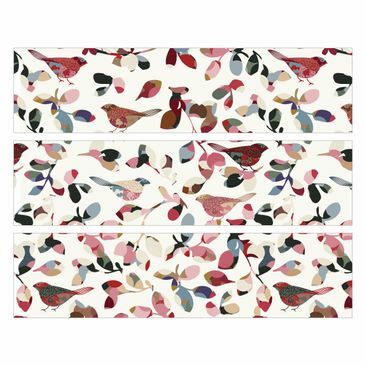 The adhesive furniture decals consist of a special PVC film which is very resistant and wipeable. 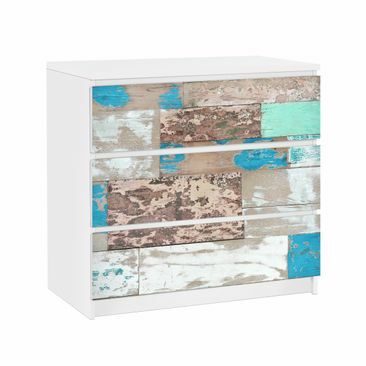 The drawers of your dresser literally gain a second skin providing them protection against dirt and scratches. Furniture decals are printed with lightfast and vibrant colours resulting in a longlasting brilliance. Microchannels in the adhesive (“Rapid Air” technology) allow for a simple, fast and bubble-free application. Unwelcome bubbles can easily be swept out below the film. With the help of a squeegee you can easily reach the corners. 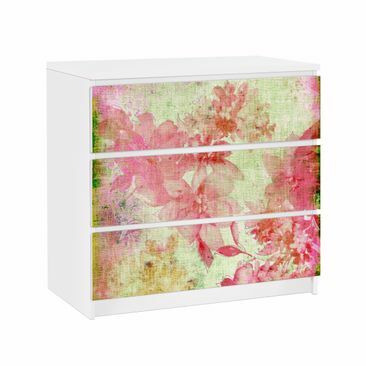 Our furniture decals are adhesive and can totally be attached without advanced decorating experience. To be sure just have a look in our mounting instructions. Naturally furniture decals can not only be used for furniture - all even or arched surfaces are suitable and can be decorated with them.